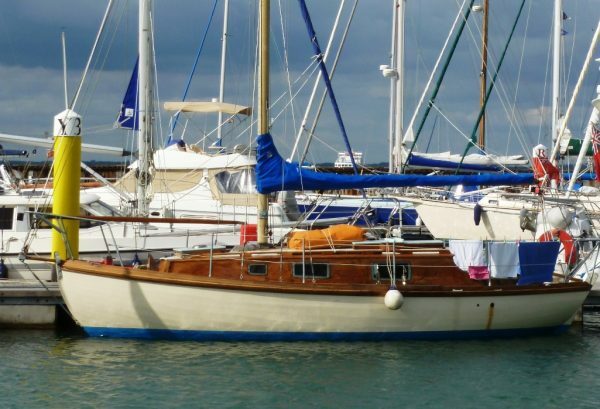 The Yachting World 5-tonner was the product of a competition staged by the magazine for architects to devise a family cruising yacht. Plans were made available widely and yachts were built around the British Isles and abroad. The plans offered three rigs, gaff cutter, bermudian cutter and sloop. Yachts were usually built with a short cabin, stopped short of the keel stepped mast. 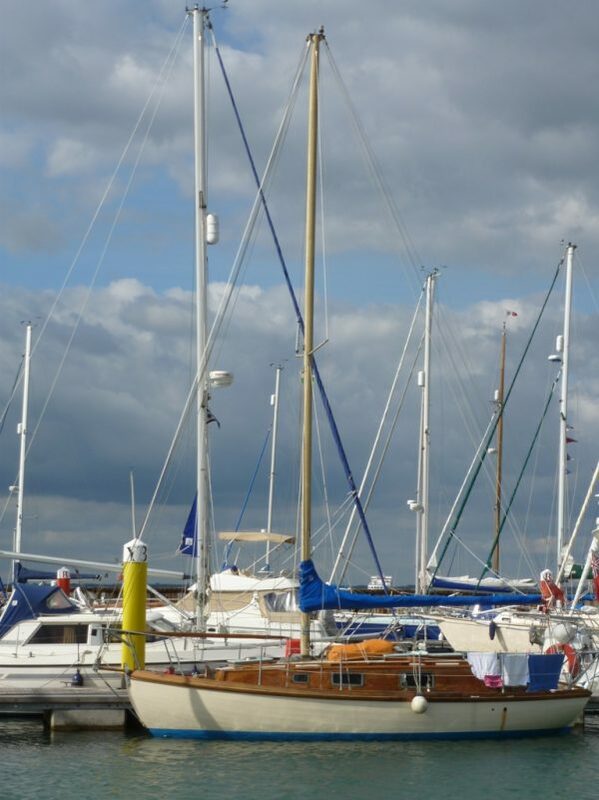 ELIZABETH JANE is an unusual example of the class, built with a long coachroof that runs forward of the forehatch, with the mast stepped on the coachroof. 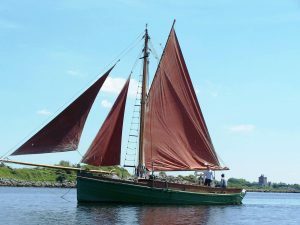 Only one other example, launched as AVIL in this style has been located, built the year before at the same yard, Thomas Skinner & Co near Dublin. ELIZABETH JANE is a good example of the Yachting World 5-tonner class by the renowned designer Robert Clark. 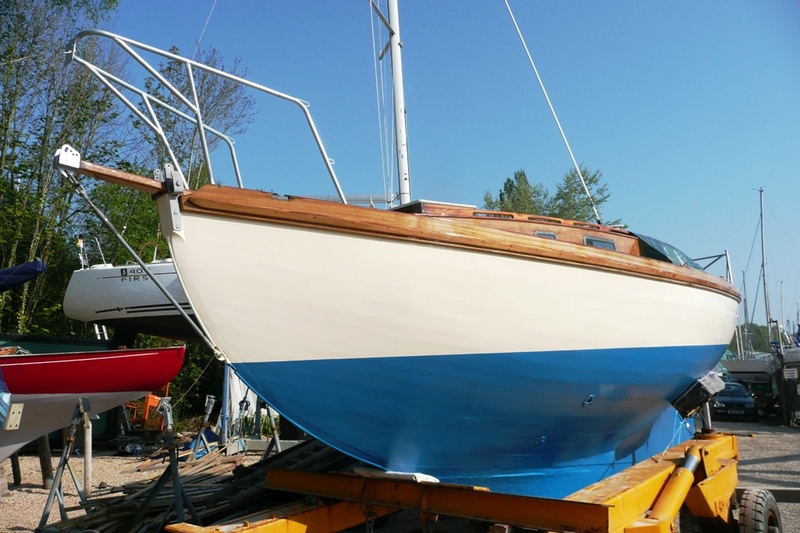 The long keeled hull is mahogany, carvel planked on steam bent oak timbers, copper fastened. 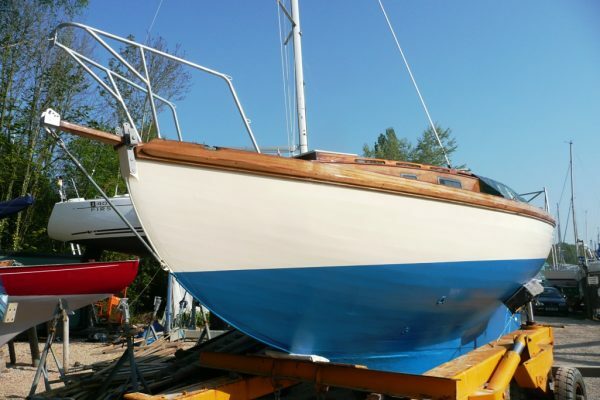 The hull is painted cream, with blue antifoul. Cabin and cockpit coamings are of varnished mahogany. Decks are painted blue-grey with a grey coachroof. An extensive refit was completed over several years to 2012, and she was sailed for one season prior to being laid up ashore in 2014. Keel of oak or elm. Deadwoods aft of oak or elm. Probably elm. Rudder is supported by mild steel straps and steel dowels. 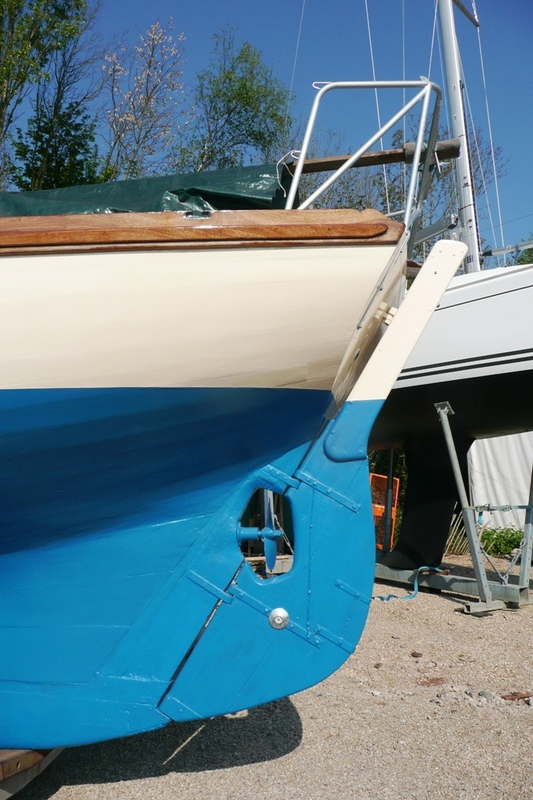 Trailing edge reinstated in oak after removal of previous self-steering trim tab. Gudgeons and pintles of mild steel. Mahogany planking, carvel laid. New lengths have been scarfed into the mid-sections of three planks each side above the garboards (2004), where affected by fastenings to previous iron straps (see Floors below). Paint finishes to topsides were removed entirely in 1995. Paint finishes below waterline were removed entirely in 2010. Copper nails through timbers, with silicon bronze screws to hood ends. Screws have been doubled up below waterline (1989). Bronze screws to hardwood floors. Copper nails through laminated oak floors. Steel bolts through iron strap floors. Centreline fastenings of bronze and mild steel. Cotton with red lead putty below waterline and white lead putty above waterline. Steamed oak timbers. Timbers have been doubled amidships in way of the bilge stringers, in the forepeak, and in the tuck aft. Some timbers had been affected by steel bolts through iron straps (see Floors below), and had new sections scarfed in (2007). Timbers in way of the mast are of larger scantling. Sawn hardwood floors at mast and forward. Sawn oak and iroko floors aft. Wrought iron strap floors in way of mast and forward. Five laminated oak floors fitted through mid-sections (2007), replacing previous wrought iron straps. Cast iron ballast keel, 1.9 tons approx. Bolts are of wrought iron, hot dip galvanised. Record of keel bolt renewal as in following table (the vessel has been laid up ashore from 2002 to 2011, and from 2014 to 2018). Note: The new galvanised keel bolt no 8 will need to be inserted when the vessel is lifted ready for launch. All washers, plates and grommets are to hand, with the bolt ready for coating in black tar at insertion. Pairs of plywood bulkheads at mast. Solid mahogany bulkheads at galley and chart area also provide structural support. Plywood bulkhead below bridge deck. Solid mahogany cabin bulkhead. Oak, through fastened to stem. Pine, through fastened with copper. Pine, fitted below beam-shelves in way of chain plates. Main beams are of oak, with pine half beams to side decks. Laminated hardwood beams formed under mast. Coachroof beams of oak. Main carlins of oak. Coachroof carlins of mahogany. Deck stepped mast is support on four hardwood posts, forming struts between laminated beams and wood floors, stiffened by ply bulkheads. Wrought iron hanging and lodging knees support decks and coachroof at mast. Hardwood hanging knees support coachroof. Oak hanging knees forward and aft. Oak quarter knees. Bronze tie-rods are fitted under side decks. Adequate blocking is provided under deck fittings. Decks are of ply, with glass-fibre cloth covering. Formed of t&g pine planking, with glass-fibre cloth covering. Covering boards to margins are of mahogany, varnished, with beadings to hold edges of glass cloth. Mahogany trunking, run in single boards with cockpit coaming. Mahogany corner posts fitted to forward corners. Teak corner post fitted to aft corners. Cockpit was rebuilt in 1994, with ply and teak on iroko framing. Bridge deck is of ply, with glass-fibre and epoxy covering. Benches to port and starboard in varnished solid teak, lockers under. The cockpit sole is of ply, with a glass-fibre and epoxy covering. 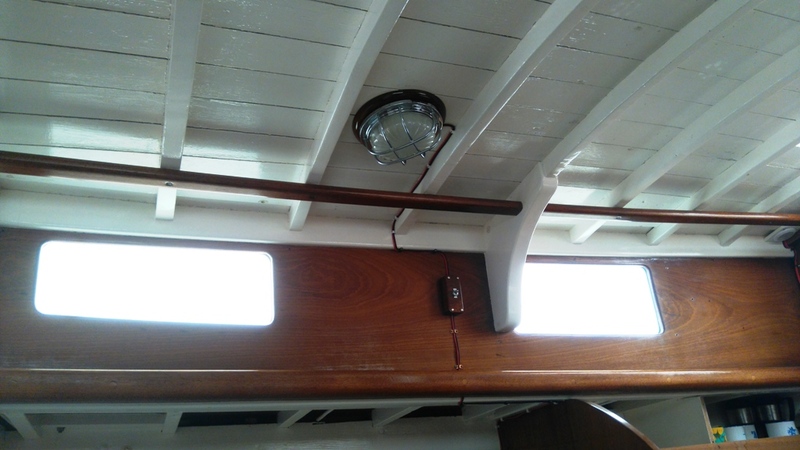 The well is fitted with a ply hatch on iroko gutters with piped drainage to the bilge. 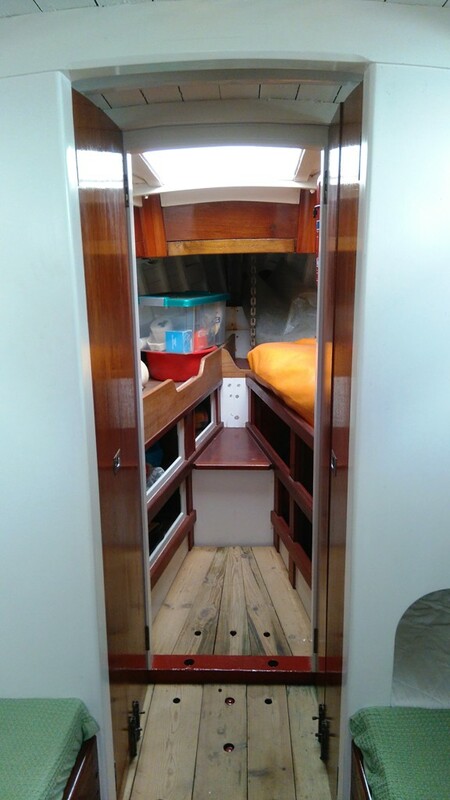 Access to aft locker with varnished teak door. Main hatch of ply, on tufnol slides, with ply and mahogany garage. Two washboards are of solid mahogany, reinforced by mild steel dowel rods. Forehatch is of ply on mahogany frame, with double coaming design, hinging forward. Three fixed glass lights are rebated into each cabin side, with bronze frames. Small circular light fitted to washboard. Stainless steel tannoy vents fitted to forehatch and above the toilet. Bronze mushroom vent fitted to aft deck. Bower anchor, 20lb CQR, with 20 fathoms of 5/16” chain. Kedge anchor, fisherman type, with warp. Oak post, unvarnished, fitted through deck down to the stem. Deck seal formed with glass cloth and epoxy. Galvanised steel mast step, bolted to main beams. Mild steel stemhead fitting with chain and rope rollers, re-galvanised 1995. Three pairs of shroud chainplates in galvanised mild steel, fitted internally, with signs of superficial rusting. Plates bolted through the hull, and with lower ends bolted through the bilge stringer. Stainless steel sheet tracks, secured to toerails. Galvanised mainsheet horse, bolted through after deck. 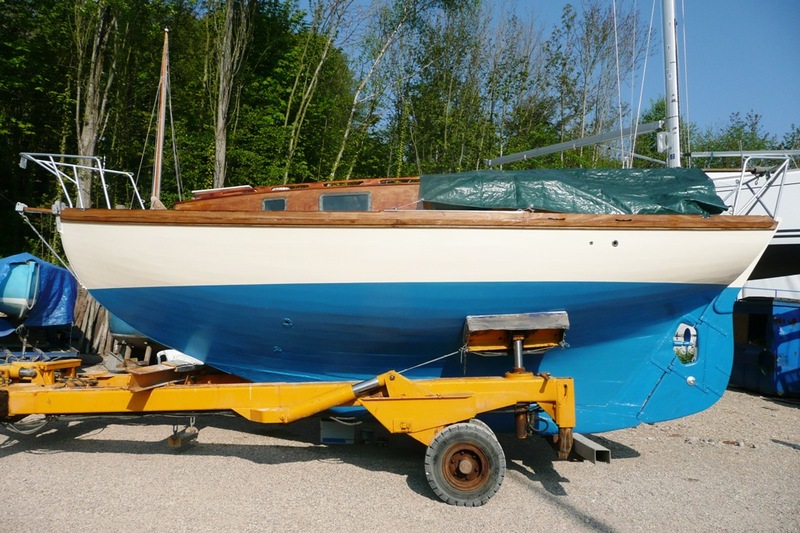 Mooring cleats are of teak, unvarnished, securely mounted to deck. 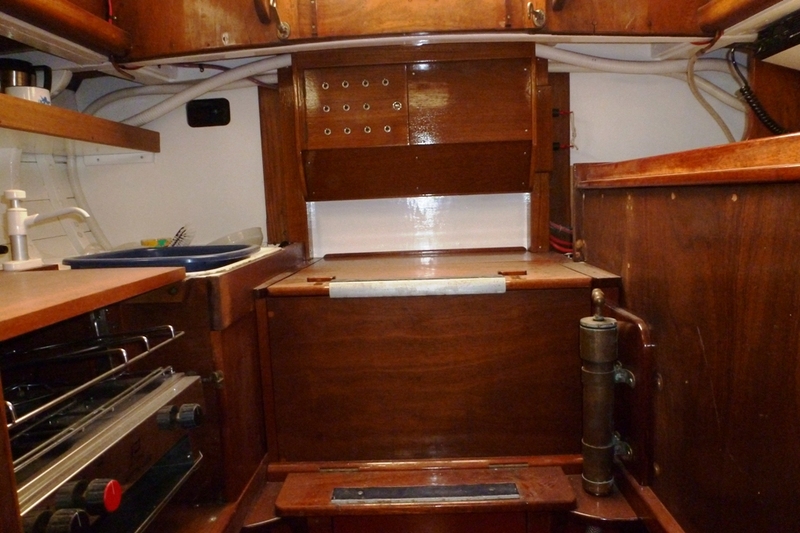 Sheet cleats are of mahogany, varnished and mounted on cockpit coamings. Galvanised cast steel fairleads let into toerail, pair forward, pair aft. Pair of closed galvanised fairleads fitted over transom. Mahogany grabrails secured to coachroof covering boards. 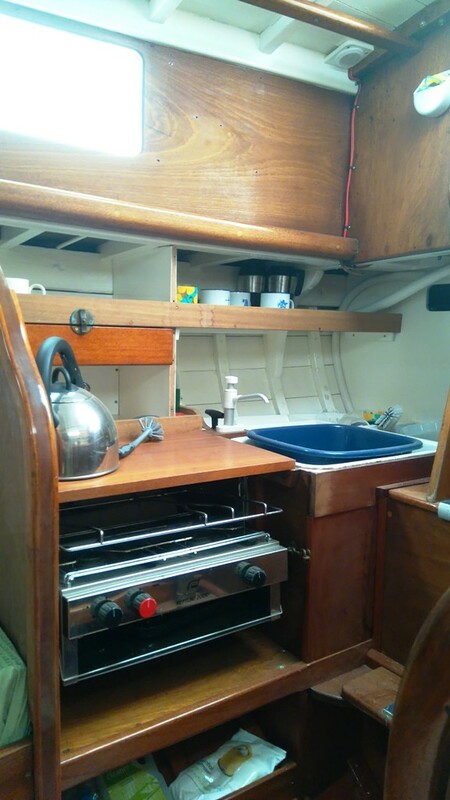 Galvanised mild steel, with plate for navigation light, bolted to foredeck on teak pads. New 2011. 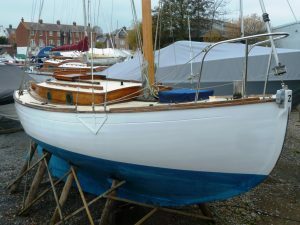 Galvanised mild steel, carrying backstay connections, with plate for navigation light, bolted to after deck on teak pads, and with straps bolted through the transom. New 2011. Four pairs of galvanised mild steel stanchions. Galvanised mild steel feet are bolted to side decks with teak pads. Two white pvc covered guardwires, 4mm stainless steel, secured by lanyards. Stanchions, feet and wires all-new 2011. Toerail is formed as a doubling plank of iroko at the sheerline (1995) iroko with scuppers at cockpit. Iroko rubbing bands are screwed to the toerail/doubler. Oak, well varnished, with stainless steel cotter pin. Simpson Lawrence bronze sheet winches, mounted on teak plinths at cockpit coamings. Bronze filler for water, to port forward. Bronze filler for diesel, to starboard aft. Deck gland for mast lights. Connector for VHF aerial. Deck glands at pulpit and pushpit. All cables run inside mast or deck fittings. The main cabin offers standing headroom, with the galley and chart station aft on either side of the companionway. 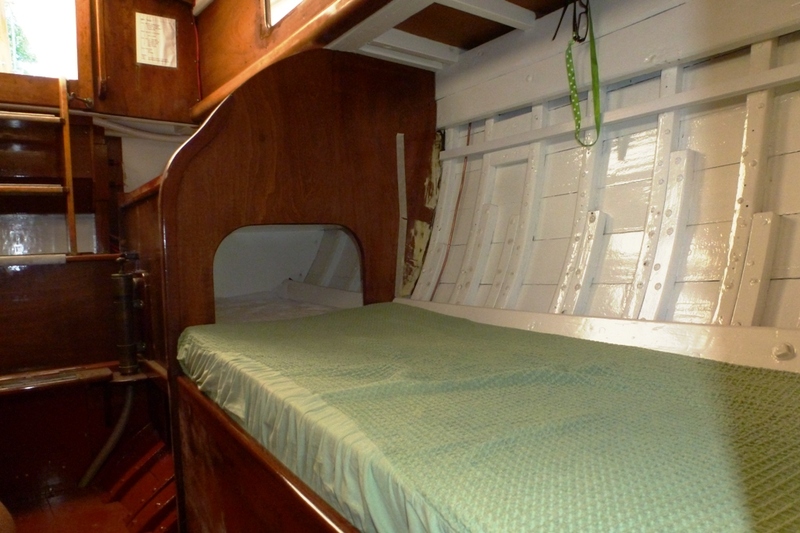 Settee berths are fitted to port and starboard. 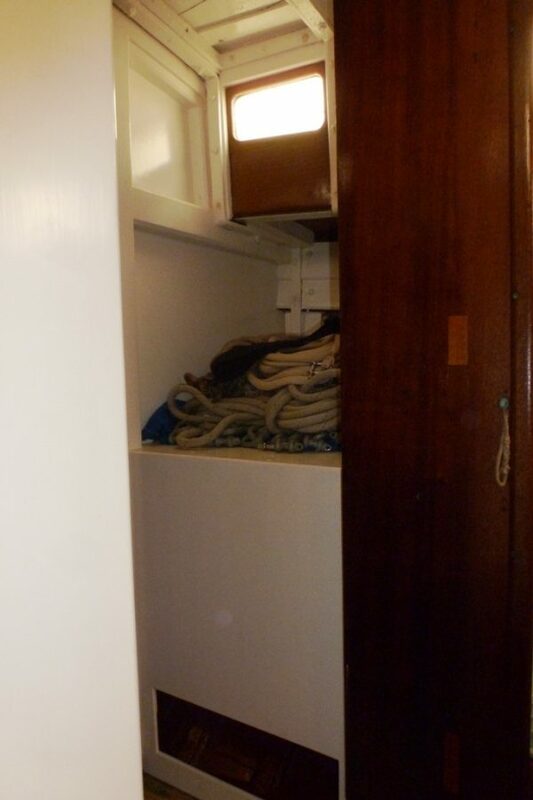 Locker space along with some shelving is offered through the main cabin and at the galley. The generous chart table is half-Admiralty size (with chart stowage under). Four structural bulkheads separate the main cabin from the forepeak, and hinged solid mahogany doors form the heads cabin enclosure. The forecabin has a berth to port with locker compartments below. 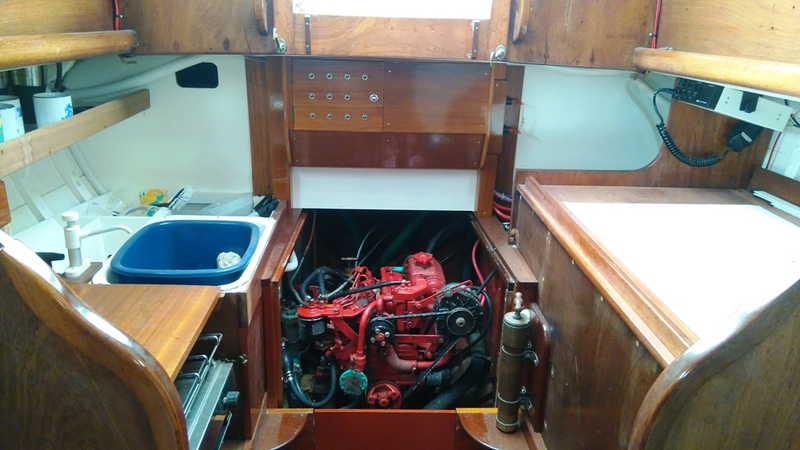 When the forecabin was rebuilt in ply and mahogany in 1992 a starboard berth was converted to additional hanging and sail stowage The anchor locker is forward. The interior accommodation structure is largely of solid mahogany boards, with mahogany joinery construction used for the unit fronts and chart area. Ply is used for galley surfaces and divisions. 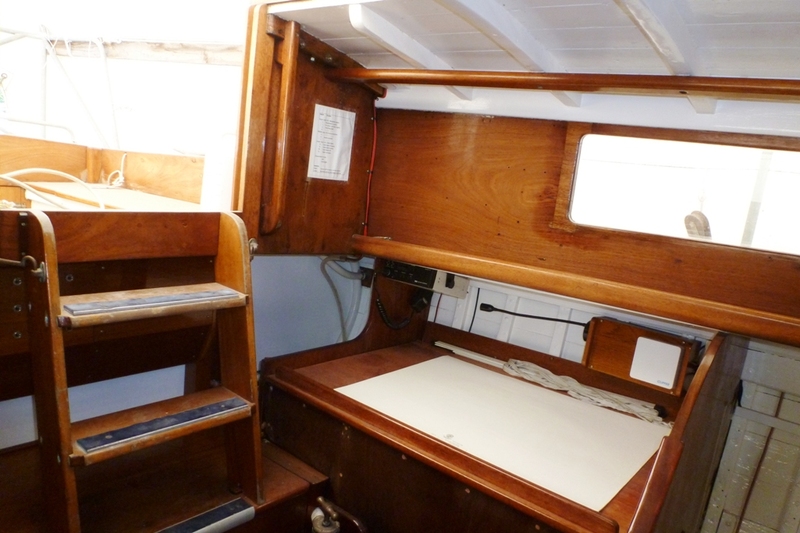 The cabin sole is of painted ply with removable panels giving access to all parts of the bilge. Beta Marine BD662. three-cylinder diesel, 17hp, installed 1994, ser no 476651. Hurth HBW35 gearbox, ser no 27-10551B. Full professional overhaul in 2012. Engine used approximately 300 hrs. Steel angles are set on top of oak engine beds, with iroko intercostals secured by steel brackets. Flexible engine mounts bolted down to bronze pocketed heads in oak beds. Stainless steel fuel tank, under starboard cockpit locker (1994). Filler hose from deck above. Flow and return fuel lines in copper, with armoured flexible tails to engine. AST filter with glass bowl. Stainless steel shaft, 1” diameter, with R&D coupling. Stuart Turner stern-gland, with a remote greasing tube, fitted to bronze stern-tube (1994). Two-bladed bronze propeller, 13”x8” (1994). Bullet anode fitted to starboard of hull aft. No connection yet made to stern-gear. Pair of anodes fitted to either side of rudder straps. Bronze hull fitting, with bronze ball valve and bronze strainer above. Vetus hose, with Vetus waterlock at low point, and bronze shut off valve in lazarette. Vetus anti syphon valve, with permanent breather pipe discharging through the transom. 2012 engine starting and separate services batteries. Interconnectors for isolation. 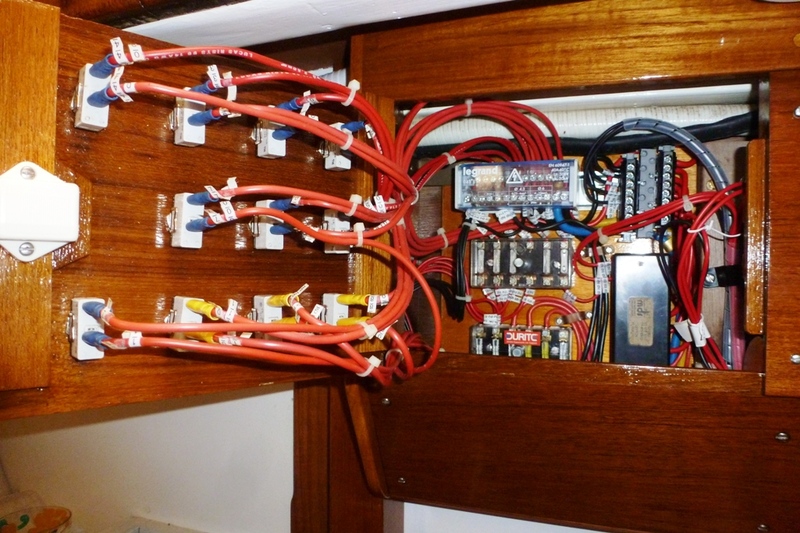 Control panel and fuse box, constructed in teak under bridge deck. All wiring renewed 2012. LED cabin and chart lighting, including night light. Traditional electric saloon light. 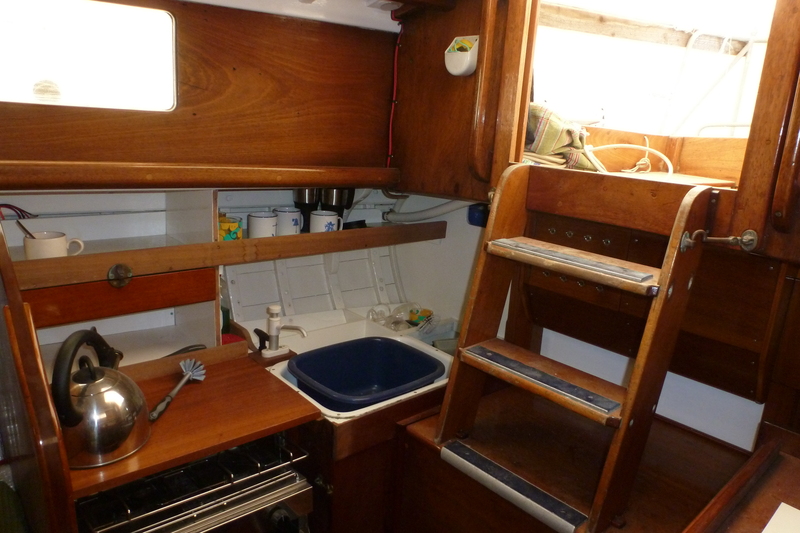 Bilges are clear and with good limbering in sawn and laminated floors. Whale diaphragm pump, fitted to cockpit. Second Whale bronze lift pump, fitted below adjacent to the companionway. 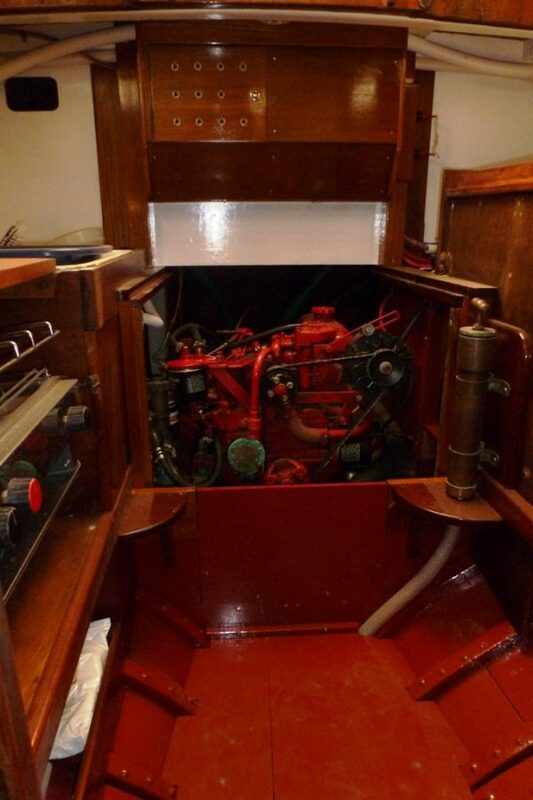 Cockpit drains to the bilge. The cockpit might be made self-draining by connection of the pipes through the hull with appropriate fittings. Neptune 2 burner and grill stainless cooker. Not operational at this time (see below re-gas locker). The gas locker needs to be completed in the starboard cockpit locker. 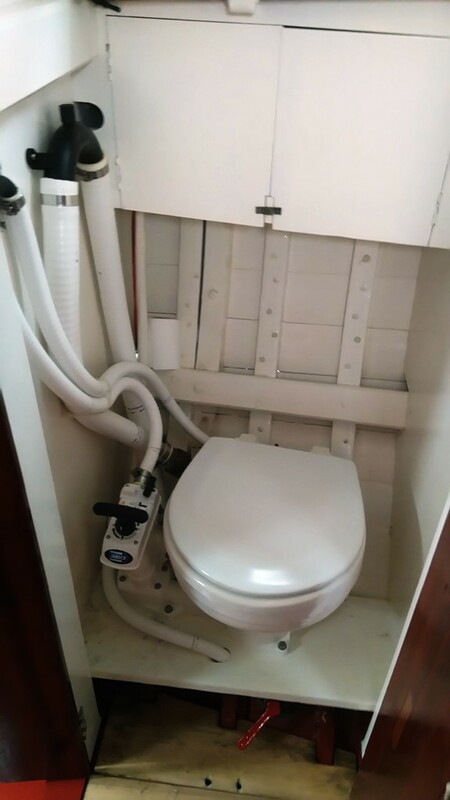 Jabsco WC installed 2013 and hoses fitted at this time. Inlet and outlet valves are bronze by Blake, overhauled and fitted with new bronze bolts. Inlet valve fitted with bronze strainer externally. Outlet fitted with bronze discharge plate (2010). Galvanised mild steel tanks to port and starboard under saloon bunks. Copper filler pipe. Flexible connection hoses, new 2011. Whale water pump fitted over GRP sink unit. Sink drain is pumped to a bronze outlet just under toerail. Husun VHF fitted at chart area. Garmin GPS, not kept on board. 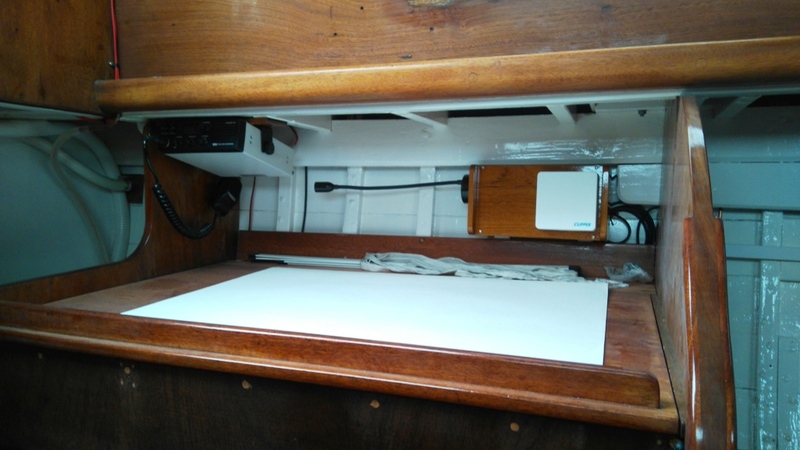 Nasa Clipper depth sounder, with display mounted in teak box at chart area. Space for electronic log, not fitted at this time. Sestrel steering compass, normally mounted above main hatch, is of some age but serviceable. Aqua Signal 41 bicolour and sternlights, 2011. 2kg ABC dry powder fire extinguisher 2013. Pair of buff multiplait jackstays, secured to galvanised eyebolts on coachroof. White winter tarpaulin by Brackenbury. Bombard inflatable and Seagull outboard, in storage. Pine boom, well varnished, with bronze roller reefing gear. Pine whisker pole, with bronze fittings. Oak bowsprit, with galvanised rod bobstay. Pair of bronze halyard winches. Tricolour mounted at mast head. Steaming light needs renewal. Stainless steel rigging of 1×19 6mm wire with swaged ends. Twin forestays, twin backstays, two pairs of lower shrouds and pair upper shrouds, all fitted new in 2011. Galvanised rigging screws, tested, fitted new 2011. 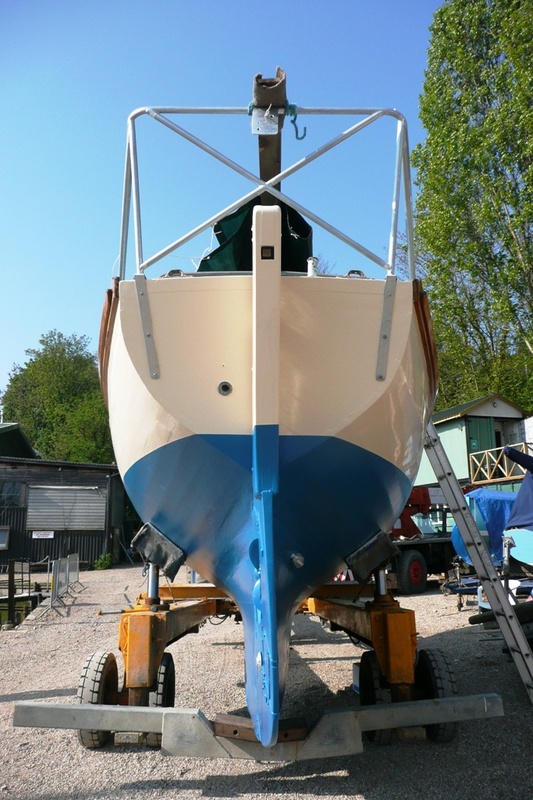 Main halyard and topping lift in buff colour braid renewed 2011. Twin foresail halyards and spinnaker halyard in three-strand, age not known. Mainsheet, white multi-plait, 1992. Foresail sheets, age not known. Mainsail, Suffolk Sails, white terylene, 1992. No 1 jib, Jeckells, blue terylene, 1970. No 2 jib, Jeckells, blue terylene, 1970. Storm jib, white terylene, 1970, little used. 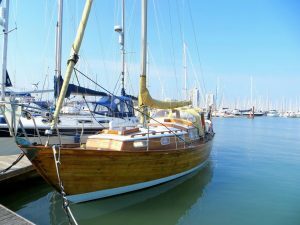 A well maintained and presented classic cruising yacht, professionally restored in current ownership. An excellent Robert Clark design offering attractive and capable sailing performance. Offering superb value at a very reasonable guide price.